Hatters midfielder Jake Gray knows his side need to start taking all three points from opposition like Cheltenham Town if they are to be considered serious promotion contenders this season. 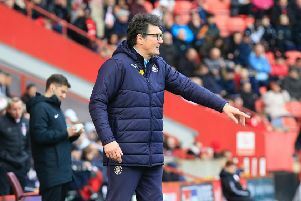 Luton head to the Robins tomorrow, with the hosts having struggled so far this season, winning just once on their return to League Two, and are currently without a victory from six matches in all competitions. We need to start pulling away a little bit more now and get some more points. Gray said: “These are the games we want to be winning if we want to be there at the end of the season, in the top three, so we’re ready to go and looking forward to it. Gray himself will be returning to the club who gave him his full Football League debut, coincidentally against Luton Town after he joined the Robins on loan from Crystal Palace, when snapped up by ex-Hatters boss Paul Buckle. He went on to make four appearances in total and on his first trip back, said: “It was my first Football League start as I’d played a couple of games for Palace in the cup before that. “I got my first chance, so I’m very thankful to the club and the manager at the time, so I’m looking forward to going there. “I don’t think there’s any players there now from my time there. When they got relegated they had a whoesale change and changed the whole squad, so I don’t really know any of the players there now. It’s the second game in a week against a former side for Gray after he was started against Hartlepool on Tuesday night, a place where he spent the majority of last campaign on loan. Gray was afforded an excellent ovation from the Victoria Park faithful prior to kick-off and also when being substituted in the second period, as he added: “It’s always nice to be appreciated and I’m definitely thankful of that, the support they gave me. “It was nice to be back and see some friends as I enjoyed it there, it wasn’t the result we wanted, but it was a nice evening for me personally. “I thought we had more than enough chances to win the game to be honest, but on another night we might have had a few more and won it.